How can I see which Media Library images are attached to Participants Database records? On the Media Library page, when the items are viewed as a list, there is a column that will show the record ID of the record an image is attached to. If you don’t see the Participants Database column, click on the “Screen Options” tab at the top of the page and enable the column there. how do i find my support question? i deleted the files through ftp and the set the names of the other plugins back to their correct name. the site is working and i can now test all of the add on plugins except for contact button and email expansion. I recently downloaded and am working with the Image Expansion Kit. I am using Google Chrome as my browser and have WordPress version 4.9.8. I have an image field with images that now appear in the Media Library (cool! ), although the link to the file was removed in my records and the photos required reattaching to the records. When I go to the Image Expansion Kit Setup page, I select “Lightbox” for my List Image Link. When I conduct a search, as a user of the website would, and then click on the image from the results, the website wants me to log into WordPress and takes me to the image file in the Media Library not as a Lightbox popup. This is more of a general WordPress theme question. I don’t know how this works specifically, but when a site-wide search result is shown, format of the results is determined partly by the search.php template. You may want to see how the theme is handling that display. Images on their own are not typically shown in search results, so I’m guessing your theme (or perhaps another plugin) is changing how those results are displayed. website.com/wp-admin/post.php?post=5140&action=edit – link provided in the Participants Database List function. website.com/wp-content/uploads/participants-database/2018/09/sorensen-_gary.jpg – link provided from the post that works with lightbox. I deactivated the Image Expansion Kit, deleted a few photos, re-uploaded them to the records, ran a search using the PB List function, hovered over the photo link, and noticed that the link is actually to the file now instead of the “wp-admin/post.php?post=XXXXX…”. It appears that the Image Expansion Kit is causing the images to be linked to a post instead of linked to the actual image file. I’m not a developer, but it seems like it should be linking to the actual file so that Lightbox can work. Hope this helps and I appreciate any advice that you have. I’m not sure where my previous reply went. If I disable the Image Expansion Kit, the Participant Database reverts back to linking directly to the image file – but doesn’t use the lightbox feature. If I re-enable the Image Expansion Kit, the Participant Database links to a post instead of the image file which sends me to the media library. I’m not a developer but it seems specific to the Image Expansion Kit, not WordPress in general. The link that is placed on an image is determined by the Image Expansion Kit settings. There are 3 different different settings for that depending on the context. Check that out, and if it’s not working as expected, let me know. I am looking to purchase this plugin add-on but I am wondering if it is the correct one for my site. I am trying to showcase images with my participants. Here is a link to a site that I would like to replicate http://www.missglobalofficial(dot)com/ (under current applicants. it randomizes photos of those who have applied). Is there also a link to a sample of what this add-on can provide? I just want to make sure this add-on will allow me to do this before I purchase it. Thank you. Yes, the plugin can help you create a showcase like this. It will require that you have some knowledge of CSS and HTML to get the exact layout you want. The plugin provides a basic framework, you will need to do the work to format the output the way you want it to look. I am working on my wp website on localhost right now. Is there any possibility that these updated images would disappear from the uploads folder ? Because it seems every time I upload the images to the object, everything is fine, except they disappear on the next day. My objects are not “approved” yet could it be it? OK, can you give me a little more detail. Are you using the multi-image upload field? Which form or page are you using to upload the image? I am using the multi-image upload field on the “Add New Participant Record” form of the dashboard only. It uploads perfectly to the object and the media library. They appear on the search aswell. All the objects are not approved yet. and then, after sometime, some hours, they are no longer on the media library and also not on the object. I will try now to add a participant on the form [pdb_signup] and also to add picture to one approved participant to see if sticks. OK, the way this works is the images are uploaded with a “pending” status until the record is saved. If you want to keep the images you have uploaded, you must finalize the upload by saving the record. This is to prevent the media library getting filled up with “orphan” images. but even when I approve a submitted object the image is still disappearing after some time,…. OK, I see the problem. I’m posting an update to the Image Expansion plugin that will fix this. Thank you so much for all the quick responses! Can you tell me also if it is possible to hide the empty fields on the [pdb_single]? you can put this into the “Custom CSS” setting in Participants Database. I tried with “maxsize::1000kb”; “maxsize::1000.00kb” aswell and nothing seems to work, how do I increase the allowed size of each picture? What is the complete setting you have in the “values” parameter of your multi-image upload field? The maxsize attribute is testing good here, so perhaps there is a problem with the setting you have in there…for instance, there should be no spaces. Also the number should just be the number, although adding the units or a decimal won’t cause a problem, they are ignored. Having other values in there is OK, as long as the syntax is correct, and it looks correct, so I don’t know why it’s not working for you. Did you try a different number like 1500 or 2000? Can you give me a link to the form so I can see what it’s doing? could you make it so it is possible to directly change it on the general settings? This is in the Participants Database settings under the general tab. Oh ! yes it is and it worked, thank you very much!! I installed the log in and the Multi-Image Uploads works fine on the front end but on the admin panel, on the “Add Participant” tab, I am not able to add the images in the supposedly multi-Image uploads field, it just says “upload…” and that’s it. Yes, it looks like I need to fix something! I will release an update to the plugin later today that will address this issue. Thank you so much for the quick answer and fix! Instructions Used: WordPress will upload the plugin file from your computer and install it for you. You will see a success message after installation is finished. At the bottom of the success message click on the Activate Plugin link to start using the plugin. The website would still function in terms of page presentation (but with the above errors flashing by quickly) and the WordPress login capability was totally nonfunctional as seen in the above screen capture link. I had to use the ISP website restore from a previous backup to get the site working again. Thanks for this information, I will look into this. Those are warnings, they will not prevent the site from working, but they should not be happening. 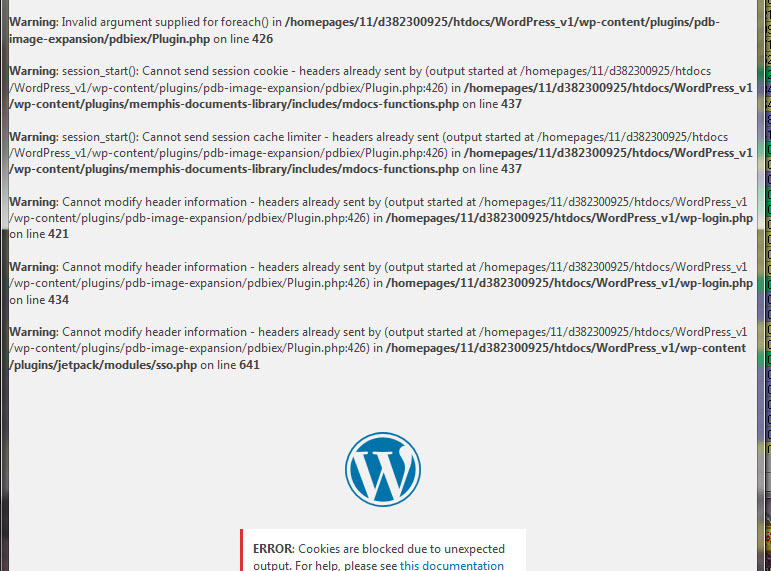 I would suggest you turn WP_DEBUG off for normal site operation so these messages won’t be seen by your users. It looks like what is happening is the plugin settings have not yet been saved, so it’s pulling up an empty set. Save the settings and these warnings should go away. I’m working on a release that will address this. Appreciate any ball park estimates as to when the release will be available to fix the above problem…. Since I could not get back into WordPress at all after the failed install (and of course the normal plug in update process) I’ll need to know what the process is obtain the revised code… My order (#5046) page shows no further downloads permitted. for Orange County Radio Amateurs at ncocra.org. You don’t need to download the plugin to get the update, it will appear in your plugins list. The issue you refer to will disappear when your settings are saved. If that is not the case, let me know.